I was listening to the Tom Joyner Morning Show and he had talkshow host, Maury Povich on the phone. 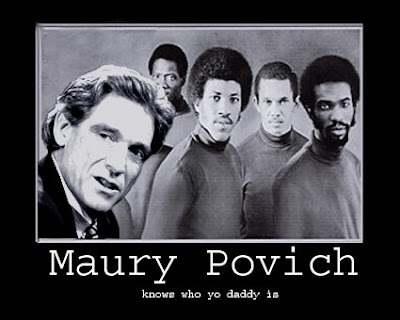 Maury was giving justification to his show's infatuation with paternity tests, when he made an interesting statement. He said that 11% of children in America are being raised by the wrong father. Meaning the guy who thinks he's their dad, actually isn't. Ladies if you're having babies, make sure the right guy is helping you raise the kid. Don't be trifling, or you'll end up on the Maury Show!